Research Brief: Is a Captive Insurance Company Right For You? In the origins of business itself, lies the concept of managing risk. Whether we are managing the risk of human capital by hiring employees or managing inventory risk by making a large purchase of raw materials or supplies that you hope to sell one day in the future. At our core as business owners, we are managing risk every day. Some of us excel at seeing the risk that lie ahead while others need a little help in seeing the risks that may be costing us money and we don’t realize. It has been this way since the first merchant began working to make a profit. It will remain this way into the future. The big question is this: how can we maximize profit and reward ourselves for managing risk effectively? As we manage the business and strategic risks that we face, we see opportunity. The same is true when thinking of our hazard related – or insurance – risk. If you run a safe organization, you should be able to profit here as well. This is where the concept of a “captive” insurance company was born. 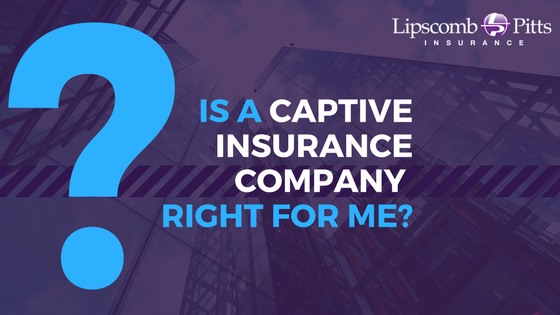 It is generally believed that captives – or privately held insurance companies – originated over 500 years ago in the 1600’s. Ship owners in London met in Lloyd’s coffee shop to write down their names and value of cargo and began to share in each other’s risk for protection of the group. This is widely considered the genesis of insurance. Even earlier, ship-owners in Italy’s seaport villages were making similar risk sharing arrangements. These are believed the first private agreements to share risks associated with shipping fleets and cargo. In the 1800s, New England textile manufacturers formed a group to share risks due to high fire insurance rates. In the early 1900s, the Episcopal Church formed the Church Insurance Company to cover risks associated with member churches. At the end of World War II, the use of captives expanded with the industrial boom. The idea of sharing risk with other like-minded companies is nothing new. Today, we refer to these arrangements as “Group Captives.” These vehicles allow companies to purchase an ownership stake in a captive reinsurance company, get best-in-class insurance services, actively manage their own cost of risk, and participate in the profit if they manage their risk effectively. A group captive is an insurance company, plain and simple. It is just an insurance company that you own. This company does what any other insurance company does: it issues policies, collects premium, pays claims and if managed correctly, pays a profit to its shareholders. Single Parent Captives have only one company in the captive, insuring the parent company and any subsidiaries. Closed homogeneous groups include companies in the same industry with similar risk profiles. Often times the group already exists outside of the captive and there is a high degree of trust between the members, who share best practices for management and risk control. Think of associations or trade groups in this scenario. Open homogeneous groups include companies in the same industry with similar risk profiles, but the group is marketed to all possible candidates. These groups are typically larger, providing greater economies of scale. Heterogeneous groups include companies in different industries. These are often turn-key in structure, attracting small to mid-size firms that want to participate in a captive but don’t want or need to control the structure. Control: As an owner/member, you’ll have greater control over your insurance program. Rather than be required to buy existing insurance bundles, captives offer the chance to unbundle insurance services so that you can choose only those services you need, from the best providers. Investment Income: Entrepreneurial business owners enjoy the asset accumulation provided by captives. By turning the insurance expense into an asset, companies create an additional source of income. Typically, over 60% of premiums are available to fund losses and generate investment income. Enhanced loss prevention and claims management: Insurance premiums are based on your 5-year loss history, not on industry averages. Captive members have greater control over the management of claims because you are hiring the third-party administrator (TPA) to handle your claims with clear direction as to how to handle certain scenarios. Risk Management: Members have the opportunity to share best practices as it relates to managing risk. Board meetings of captive insurance companies tend to turn into risk management best practice sessions. Market Condition Insulation: In the captive program, you are purchasing insurance from the reinsurance marketplace and most times, the actual cost of insurance is only 15-25% of the premium you are paying into your program. When your competitors are receiving large increases that is impacting 100% of their premium spend, your increase is affecting a fraction of your spend. Socialized – ALL risk in the group is pooled. Members surplus and capital at risk is dependent on the loss experience of the group and surplus capital is shared in proportion to the premium paid or may be shared as an equal amount per member. In most scenarios, your maximum potential out of pocket is 120 – 140% of your captive premium. As mentioned earlier, most captives offer a return of 60-70% of your premium if you perform well. There is risk and reward to any captive program. Who are Good Candidates for Group Captives? Companies that can realize the greatest benefits from group captives are well-run financially stable companies with a favorable prior loss history. Typically, good candidates have premiums higher than $200,000 annually for company Auto, Worker’s Compensation and General Liability insurance. Many captive members are business owners with an entrepreneurial attitude who especially enjoy the asset accumulation possible with group captives. Once business owners realize that turning the insurance expense into an asset creates an additional source of income, they become very actively engaged in every aspect of risk management. Entering a group captive is more complicated than simply buying traditional business insurance. Membership requires on-going active involvement and should be considered a long-term commitment. Before joining a group captive, understand the commitment required of members in terms of time and responsibilities, how members may exit the captive, how equity is managed upon an exit and any other provisions of membership. Although recent trends have 38 states in the U.S. (and counting) revising their regulations to be more attractive to captive insurance companies, most captive insurers are based offshore jurisdictions such as Bermuda and the Cayman Islands. Most captive management is outsourced to a captive manager located in the jurisdiction that holds the license for the captive. In the U.S., captive managers can be small agencies that outsource all of the administrative services: corporate or insurance attorneys draft the insurance policy, property and casualty underwriters price the policy and a tax attorney would be responsible for all state and federal tax issues. Other captive management firms provide full service, which includes all of the aspects involved in forming and managing a captive on an ongoing basis. The leading captive managers actively engage their shareholders in managing their risk. Although group captives can have a variety of structures, the leading managers share similarities regarding premium funding, reinsurance, risk sharing and collateral requirements. As companies address the high cost of employer-sponsored health benefits programs, some midsize employers are looking to captives. Companies that self-fund health benefit programs find that joining group captives allows them to pool a portion of their medical risks and reduce the cost of health care benefits. Additionally, some mid-market companies are using the reserves on their balance sheets to form “micro-captives” (section 831(b) of the federal tax code) to provide insurance where you typically cannot purchase insurance today. Examples include: supply chain disruption, loss of a key customer, funding for current deductibles, etc.. This captive election allows an organization to set aside up to $1.2 million, of actuarially supported premium, in a tax deferred manner to prepare for risk that may arise in the business. The property and casualty insurance market is demanding increases from policyholders regardless of risk controls, claims or industry. If you are a company that has been managing risk effectively, it may be time to gain education on the concept of owning your own insurance company.